Lately I’ve been staying awake all night, writing and reading. Around 5 am I hear a rooster crowing, which is really rather odd living within walking distance of downtown Buenos Aires. Often I decide to take my daily walk around sunrise. As any photographer knows, the morning sun provides remarkable light for viewing buildings. One of my favorite routes is walking from San Telmo to Plaza San Martin and back, roughly fifty blocks. Being from Tennessee, I walk relatively slow so it takes me about two hours to do that circuit, not counting stoping in a cafe or at the park. At this time of the day San Telmo is littered with remains of the garbage dissected by the cartoneros. Everything recyclable has been carried off during the night, even the plastic garbage bags, leaving only traces of the previous day’s dinner strewn along the street and sidewalks. In the early mornings I see buildings in totally different ways. Details come out that are not noticeable in the bright midday sun. South and east facing sculptures high up on the towers of Basilica de San Francisco that are normally hidden in shadows are revealed in the direct light. The statue on top of the La Prensa buiding shines a brilliant gold. At 6:30am Plaza de Mayo is completely empty and peaceful. Calle Florida also is almost deserted. None of the stores are open as only a few employees stand outside waiting to go to work. The street is absent of all those aggressive touts. Into Retiro a few early morning walkers circle around Plaza San Martin. The rising sun shines from behind the Kavanagh building, as shown in the photo. Past seven and the streets start coming alive. Porters are out polishing the little brass that remains on the posh buildings in Barrio Norte, while others are washing off the sidewalks. By the time I make it back to our apartment in San Telmo the city is bustling. Everyone knows that Buenos Aires is a great city to experience at night but it’s worth getting up early on some days to wander around at dawn. Or, if you’re already been up till sunrise enjoying the nightlife, or just reading like me, then take a walk before climbing into the bed. You’ll see Buenos Aires differently. I have a fondness for old churches. One of the prettiest churches that I’ve recently seen in Buenos Aires is Templo de Santa Lucía in Barracas at Av Montes de Oca 850. From the exterior the church doesn’t seem that large or impressive since it’s now nestled between two more modern buildings, so we were quite surprised when we saw the magnificent interior. Like a lot of old churches, parts of the inside wall are flaking. Oddly, though, some of the flaking is coming not from plaster but from beige paint. Looking beneath the flakes we saw that the wall was actually marble. Not sure who had the bright idea of painting over marble but it didn’t work very well. 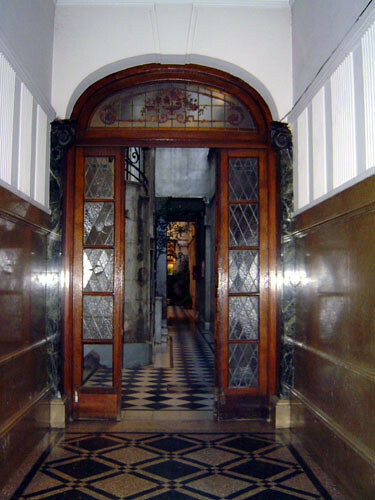 Fortunately, in other parts of the interior the marble is exposed. Several wonderful glass coverd domes, I think there are three of them, extend along the nave of the church. Each of the domes are surrounded by intricately drawn paintings. 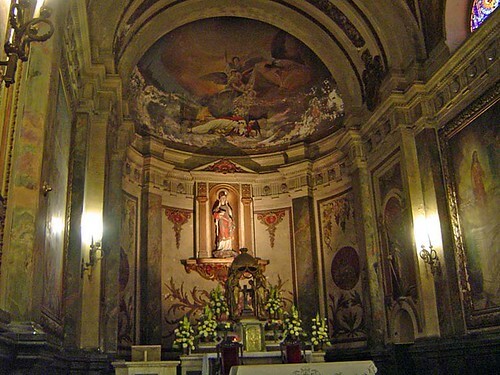 I’ve heard that Santa Lucia is the patron saint of Barracas and a chapel has been on this site since 1783. The current church was constructed in 1887. Supposedly, on every December 13, the feast day of Santa Lucia, there is a procession down Montes de Oca. That’s coming up in a few weeks, so I’m going to try and remember to go down there then. 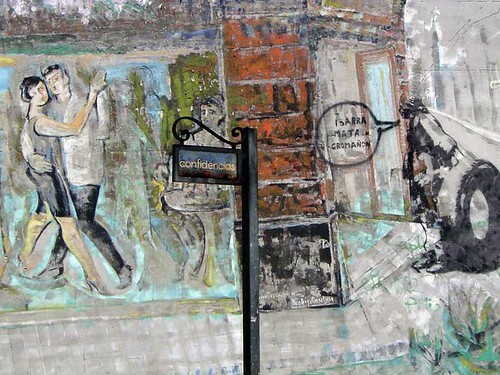 Across from a train viaduct in a southern barrio of Buenos Aires is the mural of a street scene with various additions from other artists: visible through the window of a club are couples dancing, a man stands outside the doors looking in on the crowd, from the man’s mouth has been added a word balloon: “Ibarra mata en Cromañon” ”¦ Ibarra kills in Cromañon. In front of the mural stands a lone sign with the word confidencias. A political storm over the 194 deaths in the fire at the Cromañon club on December 30 has been developing all year. I’ve written before about Cromañon. Yesterday the city legislature voted to begin impeachment proceedings against Anibal Ibarra, the city’s mayor, for negligence. Suspended as mayor pending the outcome of the impeachment trial, Ibarra vowed not to resign and claimed that his political rivals are using the incident as a way of targeting him. Politics are certainly playing a large role in this crisis. Unfortunately, the machinations that are so evident in Argentine politics threaten to obscure the institutional and societal issues that underlie the tragedy. Families of the victims are experiencing understandable pain and suffering. The tragic loss of a loved one, particularly a young life, is one of the most unbearable aspects of human existence. The collective anguish expressed by so many families results in the normal reaction to such a loss: that someone is responsible, that someone must pay. The legislator casting the deciding vote for the impeachment to move forward stated that “Ibarra has political responsibility but is not guilty of what happened”. The tragedy happened under his command and part of leadership is taking responsibility. While inspections of clubs, restaurants, and other gathering spots were launched in January after the fire, it’s not apparent that the city government has really focused on eliminating the systemic problems within the city’s institutional structure that allowed such flagrant code violations as at Cromañon. But I’m not convinced that Ibarra’s political opponents would be anymore progressive on this front either. Both political sides need to remember that one of the fundamental responsibilities of a government is to ensure the safety of its citizens. Saturday we explored Barracas, one of the southern barrios of Buenos Aires. It’s one of those places that most visitors to Buenos Aires never see unless they’re traveling securely in a tourist bus on the way to one of the tango shows; Señor Tango has a large and gaudy building in Barracas for its extravaganzas. Their only impression of Barracas may be that it’s full of squalor and old factories and warehouses. Actually, I get the idea that a lot of Porteños have that same impression. After walking around Barracas on our own for five hours on Saturday we came away with a different perspective. Certainly there is an area that is lined with factories, particularly as you get close to the river which reeks of an infamous stench. A number of makeshift residences underneath the elevated railroad tracks also gives the barrio a rather questionable character. The name of the barrio doesn’t help either. The word “barracas” means “cabins, huts, shacks” and the barrio’s name refers to the 18th century warehouses near the river that stored leather and salted meat. 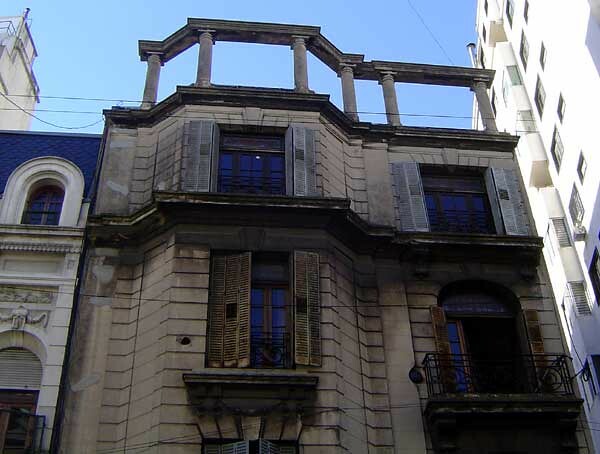 Yet, most of Barracas is a nice residential area with an interesting history that I’m beginning to learn. While I only know a meager part of the barrio’s past, I’ll be posting some photos and writings over the next few days about what we learned. If you’re only in Buenos Aires for a few days or on your first visit, then you can safely skip Barracas. But, if you live here then get out of trendy Palermo and comfy Recoleta and get yourself down to one of the southern barrios for a few hours. If you’re hesistant about going by yourself, then Robert gives a walking tour of Parque Patricios, a barrio that neighbors Barracas. Borges was very fond of the southern barrios which for him most reflected the mythological nature of Buenos Aires that he sought to create through his literature. Finally went out today and took this photo of our apartment building in San Telmo. That’s our apartment at the top. 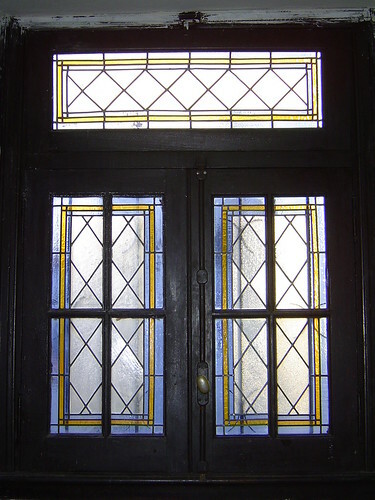 The old doors and windows are wonderful. The window on the right is the living room and the one on the left is the bedroom. The front rooms are very noisy during the day due to all the bus traffic. The noise almost drove me crazy for the first few days, particularly since I tend to sleep more during the day than the night. Now, I don’t notice it nearly as much. The top floor makes for a nice terrace that provides a good sunny spot for relaxing. Having stayed up all night, I just finished reading Colm Toibin’s The Master , a powerful novel about Henry James. What does that have to do with Buenos Aires? Well, nothing. But, Toibin is also the author of The Story of the Night , which is set in Buenos Aires during the 1970s. Toibin is an excellent writer, though I wasn’t fond of The Story of the Night. The writing is very good but I got distracted by the subplot involving an American couple, the CIA, and Menem. However, there’s not that many English-language novels using Buenos Aires as the setting, so you might want to give this one by Toibin a try. This photo is of the entrance hallway to our building. This part is covered but when you go just beyond the door in the photo you entered into a part of the building that is opened to the sky. Just beyond the door you can see the staircase up to our apartment on the top floor. Eventually, I’ll get around to putting up a photo of the exterior of the building. 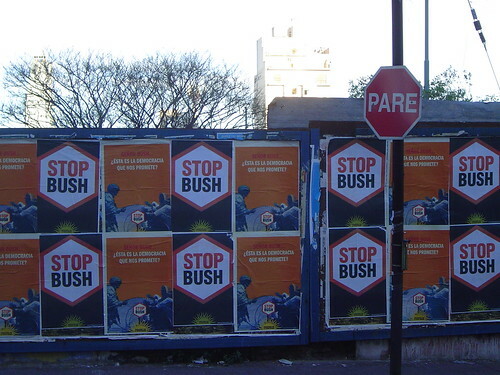 There’s a lot of anti-Bush posters and graffiti going up all over town. Here’s some of the posters I saw in San Telmo. It says “Mr. Bush, is this the democracy that you promised us?”. Robert has some good anti-Bush graffiti over on his blog. This morning I noticed that Bush’s approval rating in the US is now only 37%. But he’s still going to be president until January 2009. It’s sad to see that Argentina’s left, which suffered a dictatorship only three decades ago, can’t protest against Bush without embracing Castro. They seem to have forgotten that there is no such thing as a good dictator. It sets a bad precedent for this country: Today they admire Castro, tomorrow they may embrace another ”savior of the fatherland” who could jail peaceful oppositionists at home. I’m certainly no supporter of Bush and I’m not a fan of Castro, either. And I’m going to try not to comment on Peron, who is still very admired in this country. But Argentina’s history is full of authoritarian governments and it seems that the climate here is right for another one to develop. 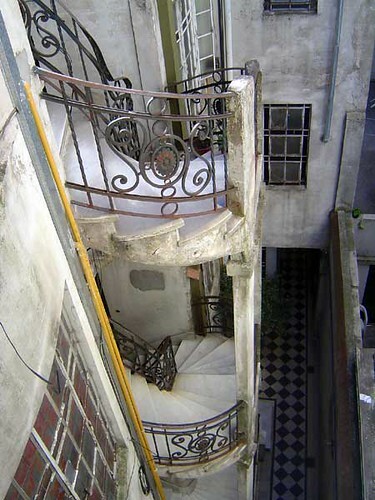 Here’s another photo from our apartment in San Telmo. This one is of the window in the office.